3:24 I will cover 1214 of 3:50, whichever comes first. 3:23 I was convinced early that it was an up da. My fractal told me so. So I was patient. Market Chaos Theory works. To learn about it, take the Cash In On Chaos and Fractal of Pi Courses. 10:26 note on the SPSunMoonMer chart that the white 440 EXMA is up-this EXMa is the "Trend of the day"
10:23 Yesterday one of the targets I had was 1218. May hit that today. 4/23/2010 10:51:40 AM MT werty:: Hi Al , i note a difference between chaos trading chart and Yahoo finance chart 1206 via 1209 , is it normal for you ? 4/23/2010 9:57:35 AM MT EOE:: Are we still in that fractal, AL? 4/23/2010 9:55:45 AM MT EOE:: looks like I need to learn everything. 4/23/2010 9:32:14 AM MT EOE:: something's not right. 4/23/2010 9:32:04 AM MT mm****:: Today is a blatant example of the advantages of trading multiple contracts and taking partial profits. Getting out at the 1210.25 resistance level gave a 5 pt profit. 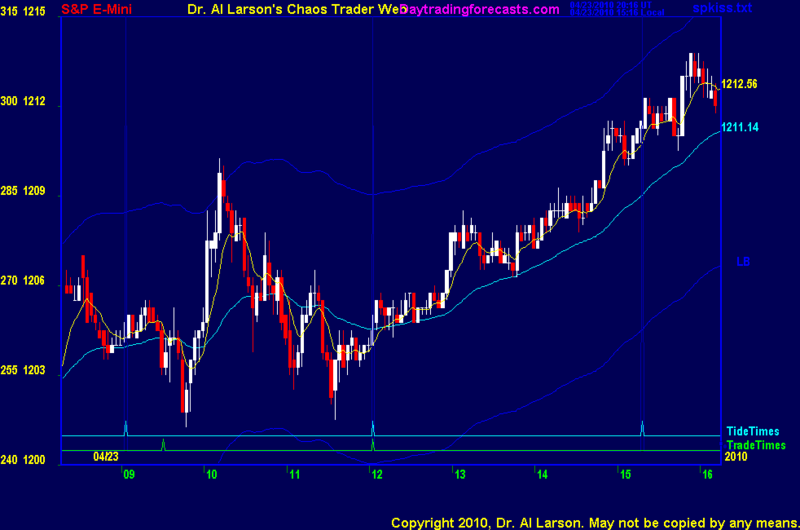 4/23/2010 9:28:13 AM MT RM:: Hi Al- the 110ema has been down for a while, but you seem very convinced we are going higher. Will you be looking to short soon? 4/23/2010 7:22:27 AM MT EOE:: GM everyone. TGIF.